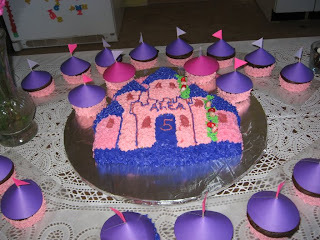 Alea's 5th birthday party was a smashing success and we are still recuperating LOL! We had 17 people, but only 2 children - Alea & her "boyfriend" Alex. Alea started the day with her presents from Mom & Dad and Grammy Lory & Papa. 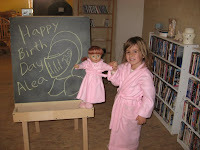 Alea & her dolly, Pearl, just loved their matching fuzzy pink robes! Mom & I worked all the day before on cake, cupcakes, & pinata. We never got to break the pinata which I think did NOT break Tomy's heart LOL. 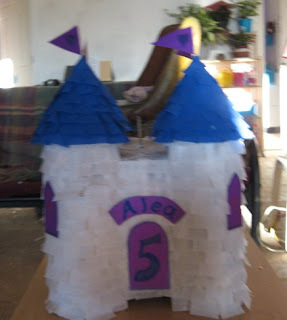 The party theme was the Princess castle, changed the last minute by Alea, I was supposed to make a doll cake (one of those skirt ones with a doll pick body) but as I was getting out the stuff Alea decided she like the castle pan better so Tomy & I switched gears. We had homemade pizza, salad, chips & dip, punch, and cake & ice cream - lots of everything! The confetti balloons were a big hit with Alea & Alex and we are still finding bits of confetti on things! Aunt Jessi & Uncle Willie got her a scooter so Alex used her bike & they raced around and around the room. Pin the tail on the dragon was fun, especially watching the grown-ups play on their knees. Alea got lots of "messy" presents - markers, puzzles, nail polish, etc. - wish we'd had them during Christmas break LOL! Finally managed to get pictures uploaded & placed - thank you Meari, Dawn, & Mel! We've spent the past 2 days cleaning up & sweeping confetti. 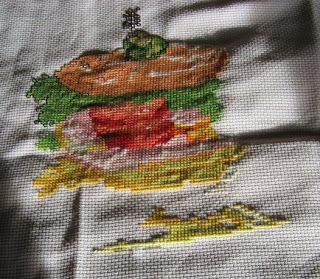 I finally got to do a little stitching - here is my latest WIP, Tall Sandwich to go with Tall Sundae. It doesn't look like much yet, but it does go fairly quickly when I do get to stitch on it. I can't wait to get it finished & hang them both in my kitchen! We're having another beautiful day today, sun & clouds with a high close to 60, but snow & rain coming in tomorrow with a high only in the lower 40s - guess I'll have to keep the fire going. Stay warm & Happy Stitching! How much fun is a birthday party, glad it was a success. The "sandwich" looks good. Sounds like you had a great time. You tall sandwich piece looks great. The party and birthday girl look great. Glad you got this blog the way you like it. That looks like a very tasty sandwich! Love the cake and the party looked like fun. The cake looks great! Lovely stitching too. I'd love to see another day near 60! Happy to hear Alia's party went well. Your stitching looks great. Birthday party looks like a blast and what a lovely cake! Great stitching! The party looked fun. Love the cake and decor. Your sandwhich is making me hungry, lol! Sounds like the birthday party was great! Happy Birthday to Alia! The cake is fabulous and sooooooo pretty! Your stitching is looking lovely! Awesome castle and the princess. Nice stitching. Cake looks really good.... Look forward to seeing your sandwich finished..
Nice cake, a lovely party. I like your big sandwich-you say there's a sundae too? How cool!